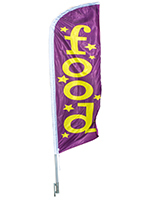 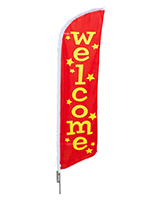 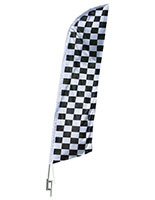 Our collection of pre-printed feather flags comprises the most popular styles with businesses. 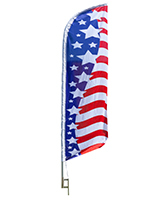 The traditional OPEN and SALE models feature patriotic red, white, and blue color schemes. 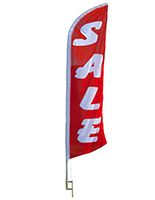 Flags designed for specific industries, such as real estate and automobiles, are available in numerous text phrases that help generate sales and traffic. 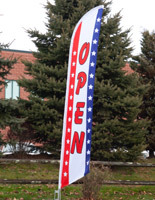 What's the most effective way to turn passersby on a street or sidewalk into full-fledged customers? 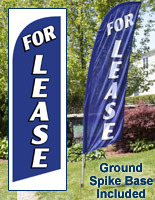 These feather banners, also known as advertising flags, are tall and colorful enough to be spotted from a distance. 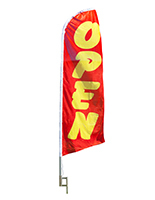 Their substantial height, starting at eleven feet and rising, towers above conventional signage. 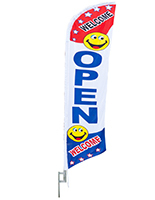 These feather banners that are sign supplies with pre-printed messages utilize vivid colors to encourage passersby to enter a shop or showroom and buy goods for sale. 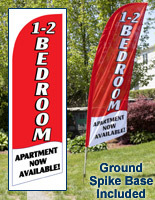 The stock text stands out against a crisp, white background. 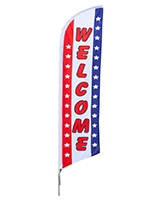 Each of these feather banners, like commercial swooper flags, ships with all the hardware needed for quick setup. 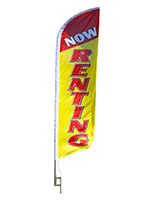 These sign supplies offer a large selection of custom printed messages from “Sale” to “Fresh Coffee.” Whether announcing the opening of a new store, or a deal on leased merchandise, this signage is a great choice for marketing your business. 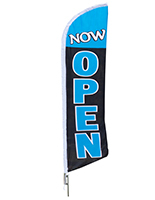 These single sided swooper flags for advertising feature stock messages that flutter in the breeze, making custom text more visible to passersby. 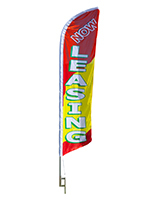 Typically used in retail stores, real estate firms, car dealerships, shopping malls, supermarkets, banks, hotels, and trade shows, these teardrop feather banners for outdoor promotions come in in tons of designs and colors. 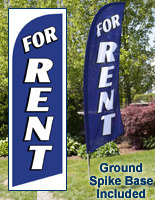 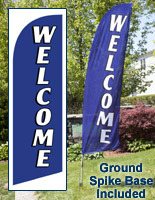 Celebrate the summer with polyester signs in lieu of vinyl banners. 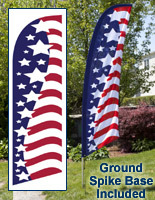 Blade shape displays and pre-printed flags with patriotic color schemes enhance sidewalks during the holidays. 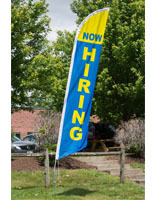 So that’s the top of things. 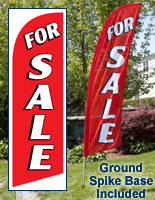 Now, let's get down to the bottom. 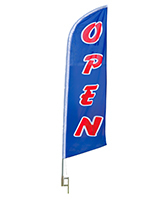 What (4) base options can my company choose from with these sign supplies? 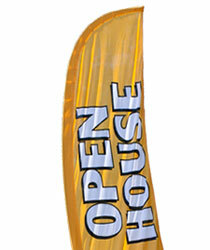 Cross Base and Water Bag Base: Set the water bag on top of the feather banner’s metal cross base inside a showroom. 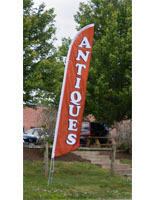 This fixture can be used outside if filled for a steady presentation, but should be taken inside when winds kick up. 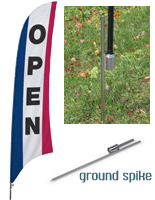 Ground Spike Base: This popular base style in wholesale flags is a simple spike that has to be driven into the soil or grass to keep the fabric open and the stand upright. 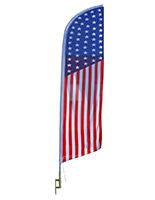 This stand is not appropriate for indoor use, but that's a given! 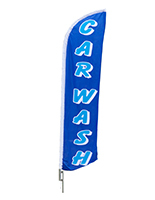 Car Foot Base: This style of sign supplies looks like a flat "V" with a small, rectangular end, and is held in place by the wheel of a car. 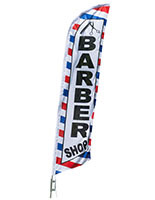 The two spokes of the "V" nestle against the wheel, supporting graphics. 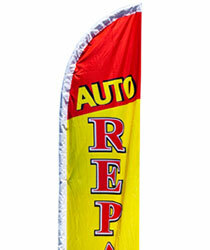 This model works best in parking lots & showrooms. 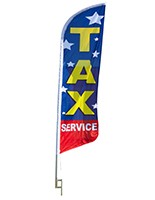 Plastic Water Base: These bases are the most expensive ones that we offer, but they provide the most stability for your advertising bow flags; make sure the stand is filled when placed outside in windy weather to stabilize it. 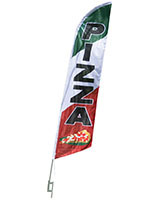 These swooper flags are constructed from an easy-care, long-lasting polyester blend that is 100% dyed-through to keep graphic colors bright with repeated outdoor use. 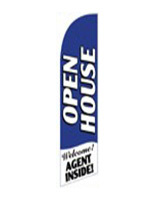 These wholesale custom printed sign supplies for trade shows and sales showrooms have reinforced stitching to last for years. 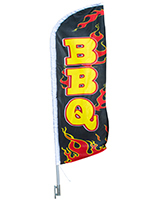 The polyester material is 100% dyed-through, which provides a mirror image of the stock printing on the banner’s other side. 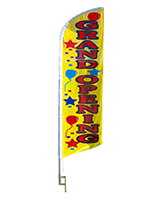 Each of these sign supplies has an aluminum pole to keep flags upright & secure while graphics twist freely in the wind, drawing attention from passersby than conventional static advertising. 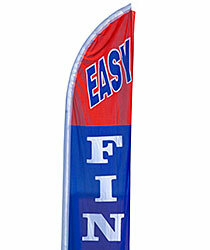 The bracket collapses into (3) parts for convenient transport. 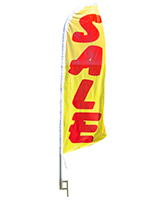 It is advised that these single sided sign supplies are taken indoors if bad weather hits, to prevent damage to the display. 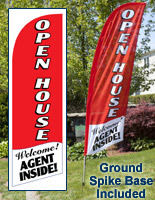 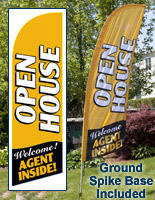 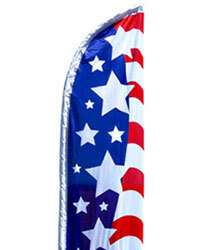 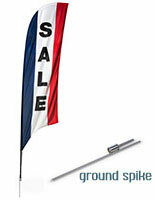 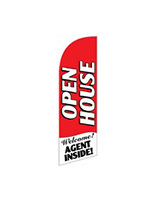 Boost traffic with wholesale flags with an alluring, curved design!